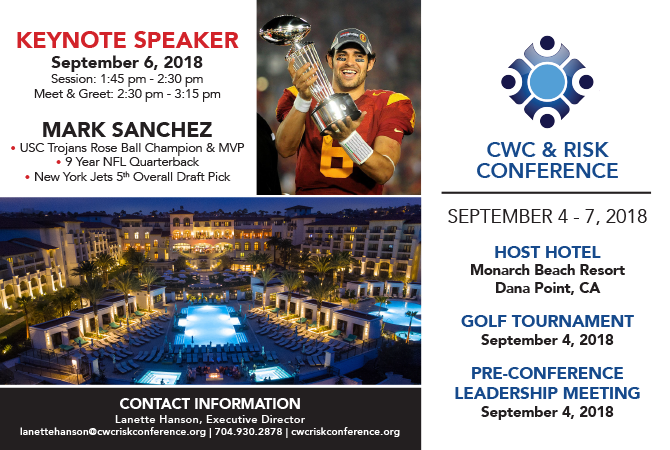 The AWWC will once again kick off the CWC & Risk Conference in Dana Point with a forum and networking event. We will hear from keynote speaker Michelle Brooke-Marciniak, Co-Founder and Co-CEO of SHEEX, followed by a panel highlighting leadership and the importance of prioritizing work-life balance across different decades in life. Sunrise Yoga Session on the Grand Lawn - Sponsored by: LegalNet, Inc.
Our national workers’ compensation system is constantly evolving with pressure from multiple stakeholders including the applicants bar, employer lobbyists, and many others who benefit from this arguably over complicated benefit delivery system. Because of this, managing a multi-state worker’s compensation program is a significant challenge for risk managers. The dynamic nature of workers’ compensation and the fact that there is no national workers’ compensation program, can truly keep a claims team confused and, if improperly administered, will result in fines and penalties against the employer. Although recent reform efforts in California have been successful in the eyes of most employers, it remains the highest cost state for worker’s compensation in the nation. This Panel will discuss the current state of workers’ compensation, potential headwinds with a new governor, and the impact that California WC has on national employers choosing California as a place to expand their business. How is California different than other states where you operate? Unique challenges, costs, etc.?? Do you believe that companies hesitate to move their operations to California based upon our WC system in this State? How does worker’s compensation need to evolve in order to stay relevant in the future? What concerns do you have with regard to the impact the political climate could have on workers’ compensation? (healthcare reform, state vs federal regulation) How could a new governor disrupt the current environment? · Kurt Leisure, Vice President of Risk Services, The Cheesecake Factory, Inc.
Back, Shoulder, Ergo Injuries - Prevention Breakthroughs! Case Study - Sponsored by: FIT, Inc.
CASE STUDY: Learn how Southern Glazer’s Wine & Spirits achieved a reduction in sprain/strain injury costs and lost workdays while evolving their safety culture. Helping employees to prevent pain and injuries while working and at home is a win/win. SGW&S initiated programs with a holistic approach of preventing workers’ compensation claims before they happen. · Dennis Downing, CEO, Future Industrial Technologies, Inc.
Take a fun rollercoaster ride as two attorneys on opposing forces interpret the newest trends and patterns in case law. Judge Pollack will try not to pick favorites while our employer representative Mr. Hampton will explain to us why we should all care. Case Law with us will be fun, entertaining and will not be boring. Wage and Hour Violations are costing employers millions and usually are not covered by insurance. When the Wage and Hour Violations become a certified class, and Private Attorney General Penalties are applied, the penalties are multiplied putting employers out of business. There are preventative measures to avoid wage and hour violations. There are remedies for resolution and settlement when there are Wage and Hour Violations. There are methods to prevent Class Certification. We also are on a legislative panel drafting legislation to minimize employer exposure and multiplicity of penalties. The specter of an evolving catastrophic loss claim is enough to send shivers down the spine of all but the heartiest of claims professionals. It is the Holy Grail among applicant attorneys. This session will explore the birth, evolution and resolution of catastrophic claims. Join us for a fascinating peak behind the "cat loss" curtain, while learning the motivations of the stakeholders and achieving a level of comfort in handling this most challenging of all claims. Exclusively for risk managers, workers’ comp managers, claims managers, and HR managers. This session will consists of a round table format that will be highly interactive and will focus on best practices. Due to the format of this session, only the first 50 risk and claims managers will be invited to participate. · Heidi Bastien, Director of Risk Management, Rubio's Restaurants, Inc.
· Jessica Cook, Manager, General Liability, The Cheesecake Factory, Inc. This session serves as a crash course in claim closure projects, often referred to as CIWs (Claim Inventory Workouts), and provides a deep dive into the closure effort for California workers’ compensation claims. In the State of California, a properly thought-out workers’ compensation claim closure project can offer an enormous return on investment; but a successful effort requires pre-work, monitoring, and planning for the future to sustain the effort. In this session a panel consisting of an actuary, claims manager, and risk manager will provide an overview of the California workers' compensation landscape and why it is fertile ground for a claim closure project. They will explain the investment of resources required to launch and maintain the effort, provide some examples of how to build a business case for investing in a claim closure project, demonstrate how results early on in the project are manifested in actuarial data (not good), provide some parameters around how long one should expect to wait before seeing favorable actuarial results emerge, and offer ways to sustain a CIW culture in your claims shop well beyond the project end date. 1. Have the foundation needed to understand the complexities of a claim closure project and support/champion the effort. 2. Identify the characteristics of an open claim inventory that make it a good candidate for a claim closure project. 3. Have some techniques in your tool kit that can be used to build a business case for investing in a claim closure project. 4. Understand the impact of a claim closure project on actuarial data. 5. Know what permanent changes can be made to the claims administration process to sustain the claim closure effort beyond the project end date. · Beth Dupre, Managing Director, National Claim Consulting Practice Leader, Marsh USA, Inc.
For the first time in history, Medicare intends to implement a review process as early as July 1, 2018 for Liability Medicare Set-Asides (LMSAs) and No-Fault Medicare Set-Asides (NFMSAs). Further, Medicare has taken steps in 2017 with medical providers to verify LMSA information, prior to billing Medicare. How this Medicare review process will work is completely unknown. Additionally, there are many questions about the inclusion of an allocation for future medical care in settlements with Medicare beneficiaries. The panel of experts will equip attendees with Best Practices for protecting Medicare’s interests with regard to future medical in liability and no-fault cases. In addition to discussing LMSAs, the presenters will dive into recent aggressive Medicare Advantage Plan litigation aimed against attorneys and insurance carriers alike. It is critically important that all settling parties be able to protect against such actions. This well-rounded insight comes from decades of experience in the field, and is offered from the perspectives of a third-party administrator (TPA), self-insured organization and Medicare compliance expert. Their knowledge and understanding of real-world applications will prove to be indispensable in preparing attendees for the realities of compliance in 2018. In this session you will learn how telehealth solution works for occupational injuries. What injuries are appropriate, what you need to know about privacy and HIPAA, and what a good telehealth solution looks like. This panel is comprised of an attorney experienced in dealing with cannabis law issues, the liaison for cannabis related issues for the California Department of Insurance, and an executive from the leading insurance carrier in the cannabis space. Their discussion will outline the current state of legalization for cannabis, review the key legal developments in cannabis law impacting the worker’s compensation industry and explore the current marketplace and opportunities for worker’s compensation within the cannabis industry. The Private Attorney General’s Act allows employees to recover civil penalties for certain Labor Code/Wage Order violations. Join Amber Solano, partner with Atkinson, Andelson, Loya, Ruud & Romo to discuss and understand the implications of a PAGA claim and best practices for mitigating risk. 1. Understand the effectiveness and exposure that a PAGA claim brings to the organization. 2. Review specific case law of notice and standing. 3. Practices to implement to comply with various wage & hours laws that most often cause exposure. The presentation will discuss the Power of Words as positively or negatively influencing the direction of claims. We will initially discuss the concept of the power of words with supportive evidence that demonstrates how and why words directly influence desired direction and outcomes. Next we will review the opportunities to influence the direction and outcome of a claim at the employer level, claims level, and during litigation. We will highlight the critical opportunities of each to illustrate the direction our words can take and the costs or savings in each. We believe our industry is just scratching the surface of this topic. Education leads to training, training leads to action, and action leads to savings. We hope through this presentation to raise awareness and inspire training in our industry on the Power of Words. Early Intervention in Delayed Recovery of Injured Workers – Sponsored By: IMCS Group Inc. The employer risk\claims management and medical leadership identified the problem that a percentage of injured workers do not recover within expected disability durations and these injured workers account for a disproportionate amount of the claims costs. They then identified from the literature and claims reviews that psychosocial factors are predictive of this population. The employer then designed and piloted a brief biopsychosocial intervention, measured the outcomes and subsequently deployed the intervention across a full region and then nationally. The opportunities and challenges of moving from pilot to full nationwide implementation will be presented. The employer Director of Managed Care and Disability will outline the employer workflows implemented including the role of the risk management and HR return to work coordinators, the claims organization adjusters and case managers and the outcomes demonstrated. The Psychologist Network Medical Director will discuss the workflow for managing the integrated care by the workers’ compensation treating providers, the biopsychosocial assessment and treatment protocols utilized and how the biopsychosocial model of care does not create unwarranted ‘psych’ claims. · Michael Coupland, Network Medical Director, IMCS Group Inc. This session will provide a recap of issues and developments impacting self-insurance and self-insured employers for 2018. Additionally, participants will be provided an overview and important insights into expected developments for 2019 - including a recap of national trends and regulatory developments impacting self-insured employers. A substantive review of the post-termination defense through the eyes of an employer, insurance broker and attorney. Session will review Labor Code 3600 (a) (10), key cases that support this defense and recommendations for mitigating the employer's and insurance carrier's exposure. · Marjorie Davidson, WC Manager, Bimbo Bakeries USA, Inc.
Subrogation refers to circumstances where an insurance company or other party attempts to recoup expenses for a claim when another party is potentially responsible or liable for causing it. When Good Shoulders Go Bad: A step by step guide to better outcomes - Sponsored by: MedRisk, Inc. Shoulder pain is one of the most common musculoskeletal disorders in workers’ compensation, second only to low back pain. The management of rotator cuff tears should be considered in the context of the risks and benefits of operative versus non-operative treatment. Tear size and acuity, the presence of irreparable changes to the rotator cuff or glenohumeral joint, and patient age should all be taken into account. Clear communication among the referring physician, the interpreting radiologist, the orthopedic surgeon, and the physical therapist is critical in order to walk the fine line between unnecessary surgery and the irreversible, adverse changes associated with prolonged nonsurgical care. This presentation discusses the diagnosis and treatment of rotator cuff tears (RCTs) and reviews recent research and evidence-based treatment guidelines along with the risks and benefits of surgery and conservative care. · The top 3 pitfalls in radiologic interpretation for RCTs that can lead to unnecessary surgery. · The danger signs that physical therapists and claims professionals need to catch and communicate in order to facilitate recovery. · What the latest research and evidence-based guidelines say about conservative care versus surgery so you can authorize the right care and the right time. · Mary O’Donoghue, RN – Moderator, Chief Clinical and Product Officer, MedRisk, Inc.
3. Strategize the most effective means of optimizing SB 1160's enactment. Disengaged employees at times can be a result of the lack of impactful engagement by leaders. As leaders in the workplace, our ability to engage our employees especially our injured employees, is critical to mission success. In today's working environment, where we can spend more time working than at home, engagement is directly linked to bottom line and worker's safety. This motivation and informational keynote by Dr. Lee, former USAF flight surgeon and occupational medicine physician, will leave the audiences energized and with a higher level of commitment to better engagement and excitement in the workplace and throughout the claims process. Safety, security, loss prevention and workplace violence. “how and why” standard. Keys to proving apportionment. 2. Benson v. Workers’ Comp. Appeals Bd. “inextricably intertwined” Multiple claims, successive injuries – apportionment. Every physician must try and parcel out apportionment between successive industrial injuries. “seismic change” An employer is entirely responsible for both medical treatment and permanent disability arising “directly” from unsuccessful medical intervention without apportionment even in situations where the need for the surgery or medical treatment was necessitated by both preexisting industrial and nonindustrial factors or conditions. “rebutting the AMA guides” The PDRS rating is prima facie evidence and therefore rebuttable. Rebut a PD rating by successfully challenging one of its components. “know your client” A third-party administrator must inform the Board and its counsel, if any, no later than at least the commencement of any litigation in the case, who the third-party administrator's client is, whether a self-insured employer or an insurance carrier. This is a presentation for WC Claims professions with or for a self-insured entity who need more information regarding claims management in matters involving an excess carrier and SIR. Learn about the nature of an Excess Policy, its purpose, who needs them, and who's required to have them, common pitfalls with claims handling involving an excess carrier, and excess dispute resolution. 1. Understand why the common practice of employment resignation in conjunction with a C&R settlement could give rise to a cause of action for disability discrimination and/or wrongful termination in violation of California public policy. 2. Learn how to structure a Workers' Compensation settlement so that employment is terminated without a violation of either California law or public policy. 3. Understand why CMS Submission Compliance Criteria alone will not constitute a safe harbor against Medicare Secondary Payer Act (MSP) liability. 4. In addition to Medicare Set Aside submission and compliance issues, learn how a C&R can be drafted to protect against double damages liability for both a cause of action by the United States for reimbursement of conditional payments and a private cause of action under the MSP. The roots of the opioid epidemic have gone deep and broad into societal norms. The result: more than 100 overdose deaths a day. To effectively combat this issue in workers’ compensation, we need a comprehensive approach that confronts the problem head-on and from multiple fronts. In this session, a medication safety expert and San Diego County in the role of an employer and law enforcement present a task force approach to assess the problem and develop targeted strategies to fight it. San Diego County is building a task force to assess and address unique aspects of the problem in their community. The speakers suggest a similar task force approach, so communities and workers’ comp programs can pool resources and look at what’s worked for other regions and payers in order to adopt similar solutions for problem areas. Aspects of this multi-faceted approach would include legislative lobbying to further shore up harmful prescribing patterns; law enforcement to prosecute fraudulent practices; drug testing and zero tolerance policies to defend against impairment at the employer front, and a more patient-centric approach that aims to alleviate pain with proper medication management and alternative therapies, as well as tapering and rehab, when needed. Malingering and symptom exaggeration are among the most common types of workers compensation fraud. These types of cases can spiral into dangerous territory for injured workers with a risk of addiction to painkillers and complications from unnecessary treatment. This can become costly and lead to an elevated impairment rating that results in long-term and lifetime payouts. In this session, we will outline how certain tests, tools and practices are at a risk manager’s disposal to assess the true severity of an injury to identify whether malingering or symptom exaggeration may be occurring. A risk management professional will outline experience with the phenomena and share real-life cases. A clinical expert will outline how certain tests, tools, and practices are at a risk manager’s disposal to assess the true severity of an injury, and whether malingering or symptom exaggeration may be occurring. 1. Understand the scope of claims with malingering and symptom exaggeration in terms of occurrence and costs, and learn how to identify warning signs early in a case. 2. Recognize the common profile of injured workers who malinger or exaggerate injuries, including both occupational and demographic factors. 3. Learn from real-life cases how to apply proactive strategies that mitigate, address and prevent malingering and symptom exaggeration. · Edward Canavan, VP, Workers Compensation Practice and Compliance, Sedgwick Claims Management Services, Inc. Session walking through the new and old rules of the QME Billings. The attendees who would be interested, would be carriers, defense attorneys and applicant attorneys, all of whom use, rely on and cross examine QMEs. This topic involves significant issues regarding “billing practices” acceptable or otherwise.